Calcium Carbonate Precipitate, Cyanuric Acid Levels Falling Dramatically, Can't Maintain Chlorine Levels. Calcium carbonate (I have had this tested) is precipitating out of the pool water. Pretty sure this happens when the electrolysis cell is running. Cyanuric acid levels drop very quickly. The pool has been shocked quite a few times recently. On one occasion free chlorine was about 17ppm after adding sodium hypochlorite in the late afternoon and had reduced to about 3ppm the following morning. I really doubt there is anything wrong with your cell... You simple have algae, whether you can see it or not..
Salt cells cannot produce FC faster than algae can eat it. I don't think there is anything wrong the cell either, thought they do 'wear' out and I want to eliminate it a problem source. Any suggestions on why cyanuric acid levels are falling so quickly? And calcium carbonate precipitate? Hi Martin, welcome to TFP! Are you adding CYA after you see the levels drop? If so how are you adding it? Are you tracking the frequency and volume of your other chemical additions? Don't bother with the algecide. It is a weak preventative at best. It won't clear an algae problem on its own and may add copper to the pool, which you do not want. Your CYA levels should be around 70ppm using a saltwater chlorine generator (swg). The low CYA levels you average in your report will not protect the chlorine produced from burning off prematurely in the uv rays of the sun. When the chlorine burns off prematurely it can't oxidize the nascent algae bloom efficiently. Let's talk about your water testing system. How is it calibrated? Can you make it test on demand? We have seen when the Pool Stores have the computer testing systems that are way off due to not being calibrated often enough. I want to make sure yours is working as it should. I want you to do a "test" for me. I suspect that you calcium carbonate precipitate is caused because your CSI reading is not between 0 and neg .3... I know on my SWCG pool, if I allow my CSI to increase very much into the plus zone, I start seeing flakes of calcium in my robot pool cleaner. It is almost like a cream colored paste after the cleaner picks it up.. If you don't know already, our Pool Math app calculates your CSI for you.. Usually adjusting your pH and/or your TA will lower your CSI and fix the problem. As a general rule, CYA does not quickly disappear unless you have a leak.. In some rare cases, if your pool was covered in the winter and ammonia is created, the ammonia will eat CYA like crazy. Yes I'm adding CYA. Solid (powdered) to the skimmer box. The Prizma is calibrated using the Palintest. I can do an on demand test. I will do your test asap and get back to you. I measure water balance using the Palintest. It's a proprietary scale but is directly comparable to the Langelier Index. My results have always been with acceptable limits. Yes, as I understand it, CYA is generally very stable. It is highly unlikely that the pool leaks, but I will keep it in mind. The pool is only covered for short periods in winter. It is used all year round. I have checked ammonia levels before (just with a fish tank kit) Not even a trace. I will test again asap. Martin, If you have an ammonia test kit then there is no need to do my test as that is what I was thinking about. IF there was any ammonia in your water the FC would drop FAST on the 15 min test. Most people do not have the ammonia test so we came up with the 15 min test. 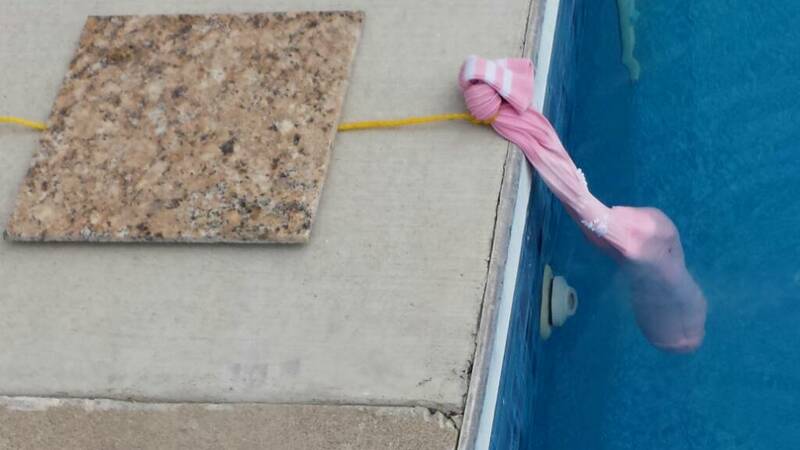 One observation: pool water went cloudy after initial sodium hypochlorite dose. Things might get worse before they get better. The cloudy could be from the dead algae parts. Make sure to keep brushing to get every thing up and into the water for the filter to grab! Things were good for a couple of days. Now basically back to square one; "Calcium Carbonate Precipitate, Cyanuric Acid Levels Falling Dramatically, Can't Maintain Chlorine Levels". Could you put your pool, equipment and test kit info in your signature please? (So forum members can reference it quickly) Thanks! Last ammonia level check (17/2/19): less than 0.5ppm NH3. I'll check again. CYN destroying bacteria? Any info? @tux, So just finished the thread, are you able to test all water parameters? Are you backwashing the filter? (what type of filter do you have?) That could possibly contribute to the CYA not getting into the pool. There are a couple of threads about it, but if you completed a full proper SLAM, then it should have been destroyed. The best way to insure there is not an ammonia issue - if it is thought there might be - is to follow the ammonia protocol. To check and defeat ammonia, if necessary, is to raise your FC in the water using enough liquid chlorine to get to 10 ppm using PoolMath. Circulate the pool for 15 minutes. Test FC. If at 5 or below, add LC to get to 10 using LC, circulate for 15 minutes, repeat until your FC is above 5 ppm after the 15 minute circulation.